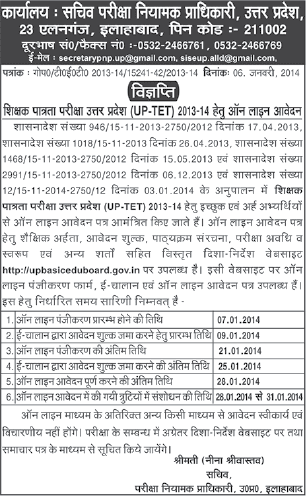 Sachiv Pariksha Niyamak pradhikari uttar pradesh / Exam regulatory and controlling authority of uttar pradesh now published the notification no GOP/TET 2013-14/15214-42/2013-14 dates 6 January 2014 for inviting online application form for UP-TET 2013-14. Official Vigyapti has been published in local news paper of 7 January 2014 edition. Eligibility Criteria : all graduate who score at least minimum 50 % marks in there graduation degree they can fill application form for the Exam of UP TET 2014. 5% relaxation will be given to OBC, PWD, Freedom Fighter, Ex service man will get relaxation in education qualification in graduation degree.